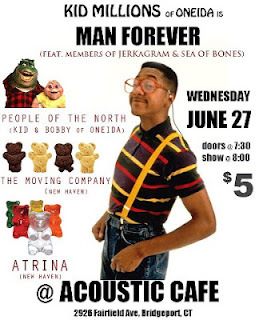 Acoustic Cafe is putting on an awesome show Wednesday, featuring all new music from members of Oneida (whom I love!). 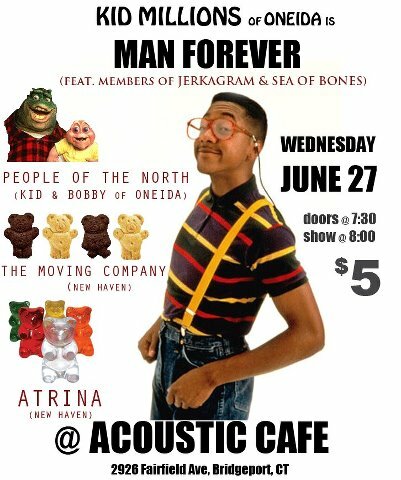 Come down and hang with cool people and experience the awesomeness. John Colpitts (aka Kid Millions) is a Brooklyn-based multi-instrumentalist, composer and writer who is perhaps best known as the drummer for Oneida. Man Forever, his vehicle for exploring the outer limits of drum performance, was created to overwhelm, to investigate the nuances that bloom in the midst of repetitive music, and to act as a pure sound experience. Past performances have included Brian Chase (Yeah, Yeah, Yeahs), Chris Baio (Vampire Weekend), James McNew (Yo La Tengo), Richard Hoffman (Sightings), Shahin Motia (Oneida, Ex Models), Ryan Sawyer (Stars Like Fleas, Tall Firs), Greg Fox (Liturgy, Guardian Alien), Christopher Weingarten (Parts and Labor), and many others. Collaborators on this tour will include members of Tortoise, DD/MM/YY, Cave and many more. Man Forever's new album "Pansophical Cataract" is out now through Thrill Jockey. Started by Kid Millions and Bobby Matador of Oneida, People of the North is another voice emanating from that inscrutable Brooklyn collective. The group has always included Kid and Bobby, and usually other members of Oneida as well. POTN has performed live from time to time since 2002; most recently, they were invited by Portishead to play at the I'll Be Your Mirror edition of the All Tomorrow's Parties festival held in Asbury Park, NJ in October 2011. POTN's album "Steep Formations" was released on Jagjaguwar earlier this year. The Moving Company is New Haven's Westest new band. Always looking for new energy and true tidings, the band brings a presence of cosmic rock and roll that combines blues, country, bluegrass, jam and freak. Moving is never fun. Due to my husband's job, I have moved 10 times in the last 12 years. Lastly I have a very good experience with Vancouver Movers. They are very professional and experienced. Till then i always call them to move on. To get free moving quotes from expert Vega Line Moving, please fill out the short Vancouver Movers quote form provided here. There is no expense or obligation involved at all and your contact details will be kept confidential.